Publisher's blurb: "The mysteries of magic are infinite. 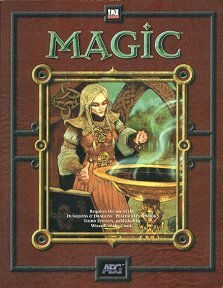 Magic details the lesser known forms of magic: Witchcraft, Thaumaturgy, Dwarven stone mages, Elementalism, Chi Masters, and more. With details on creating your own spells and magic items and rules for new spell casters, this book picks up where the Player's Handbook left off. Magic is the perfect addition to any campaign"